On Thursday, the water level was higher near a neighborhood park by Mansfield Dam and Lake Travis northwest of Austin, Texas. KUT reports Lake Travis is 146% full now and at 704 feet. If Lake Travis rises to 710 feet, the Lower Colorado River Authority may decide to increase the water flow downstream. That option would increase the risk of flooding. Open floodgates at Mansfield Dam are currently streaming water into Lake Austin. “Lake Austin is technically not supposed to flood and be a constant level, but this is unprecedented, ” said Pam and Jeff Grossman. The Grossmans have been watching the water levels rise near them this past week. 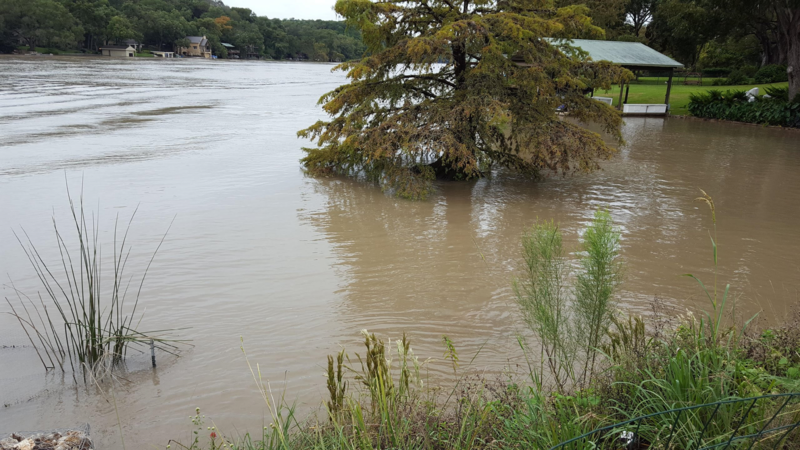 On Tuesday, October 16th, central Texas experienced heavy rainfall and historic flooding along the Colorado and Llano rivers. The National Weather Service forecasts the rain to wind down this weekend for central and south Texas. This entry was posted in Texas News and tagged Central Texas Flooding. Bookmark the permalink.